Dubai, UAE, July 01, 2018: Accurate to the point of one second in 1,000,000 years, this radio-controlled Eco-Drive Super Titanium watch from CITIZEN is one for those whose time is important for them. 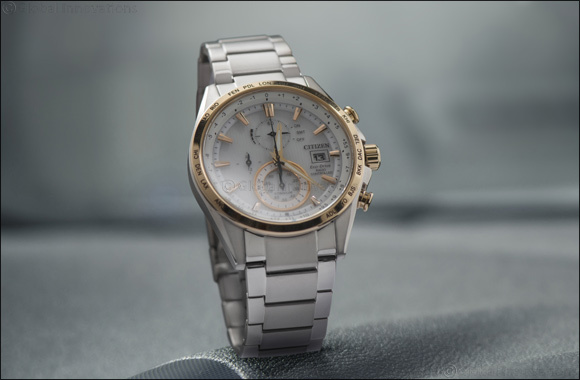 This winner from CITIZEN also comes with a stylish and powerful presence. Apart from the supremely accurate radio-controlled time function, the AT8156-87A comes chock full of features like: Perpetual Calendar, chronograph, world time and 24-hr display. The case is impressive looking in super titanium with yellow gold plating and is paired with a stainless steel strap. This watch is powered by the H800 Eco-Drive movement and comes with a 10-month power reserve, when in power saving mode.